Alors, Dernier coup de cœur pour le design avant le temps des fêtes... d 'ici là ce ne sera que des cadeaux tricotés à partir de jolis modèles que j'admire chez les autres. 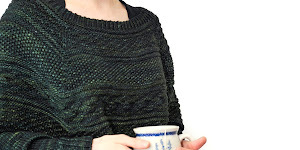 Je viens tout juste de terminer une tuque dans le même style que le chandail Spinster et le Spinster Cowl, que je dois bien evidemment nommer le Spinster Slouch. 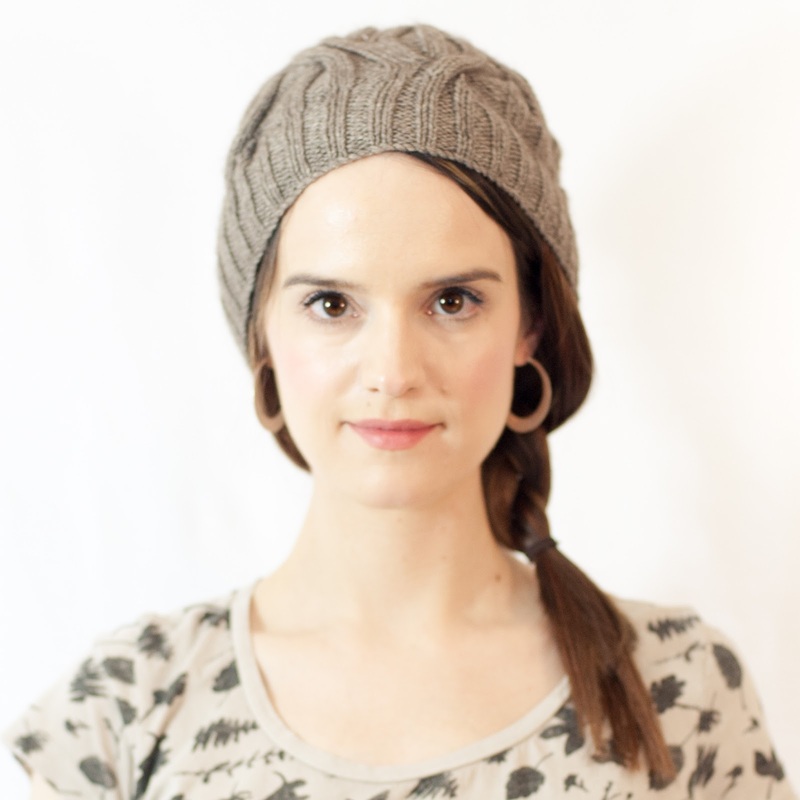 Quoique ma tuque n'est pas très slouch en fin de compte, mais plustôt un hybride entre le beanie et le slouch, faute de ne pas avoir bloqué très agressivement. Je songe à lui donner un blocage sur un bol ou un ballon pour avoir un peu plus de slouch, mais pour l'instant je l'aime bien comme ça! La laine est la Silk Yak 4-ply de Sericin Silkworks, une laine extraordinairement douce et plutôt reluisante, ce qui met en valeur la texture des côtes et des câbles. 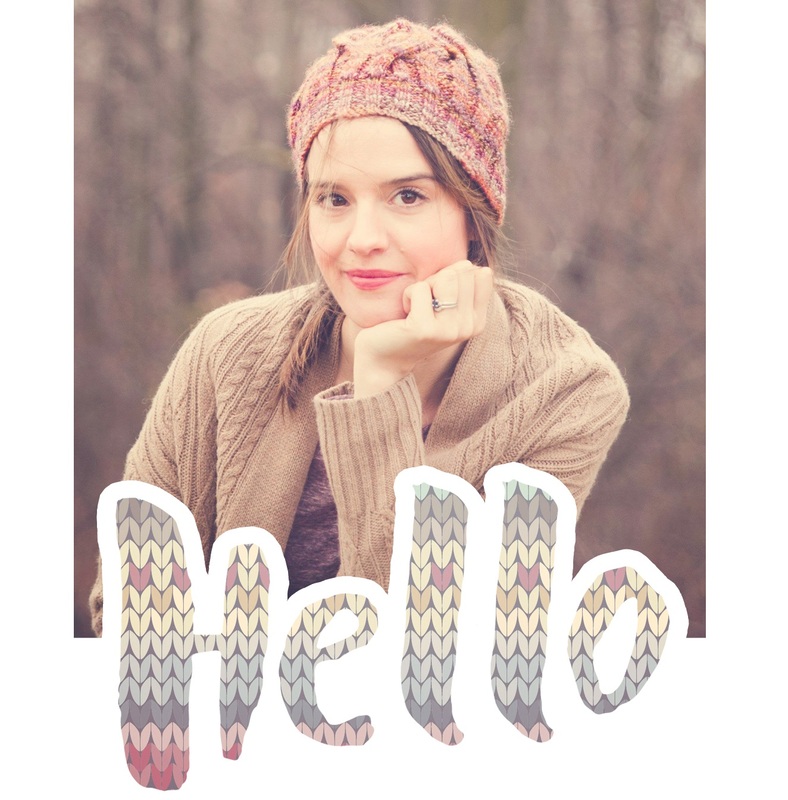 I think this will be my last new design until the holidays, and definitely the last Spinster-themed one, promise. So in the same vein as the Spinster sweater and Spinster Cowl, I just cast off this hat, which obviously must be named the Spinster Slouch. Although should point out that the hat seems to be more of a hybrid between a beanie and a slouch right now, I could have blocked it more aggressively. I just draped it over an oval coffee canister and steamed it, but could have wet-blocked it instead and draped it over a bowl or a balloon, I suppose. I might eventually to this but I like the fit right now. The yarn is absolutely luxurious, soft as a cloud and so lustrous - perfect to show stitch definition and cabling It's Silk Yak 4-ply from Sericin Silkworks. Tricoté tel qu'écrit (en anglais seulement, désolée! ), le slouch prend environ un écheveau et le le quart d'un deuxième. Il me reste juste assez pour tricoter un bandeau pour les occasions ou je porte une queue de cheval ou un chignon au travail. Gauge: 24.5 sts and 30 rows in stockinette stitch using US 6 (4mm) needles. - US 3 (2.75mm or 3.25mm) needles for the brim. 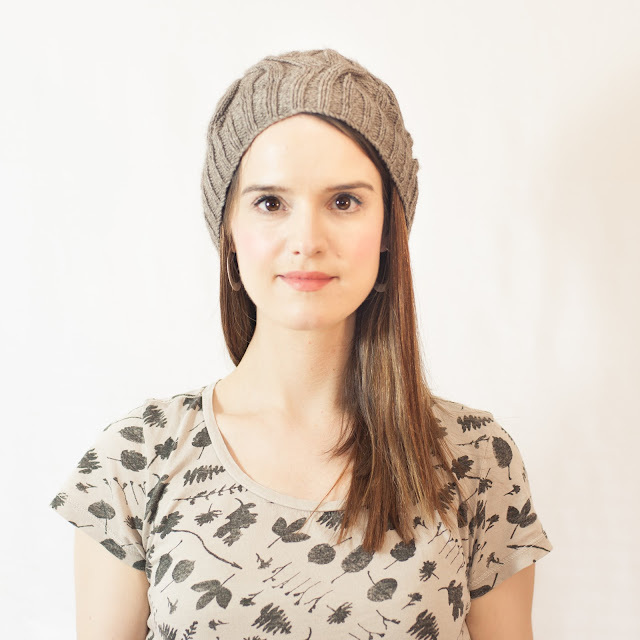 The brim will stretch over time, something to keep in mind if using a yarn with lots of drape such as this one. I might consider carrying a strand of elastic with my knitting for the first few rounds next time. 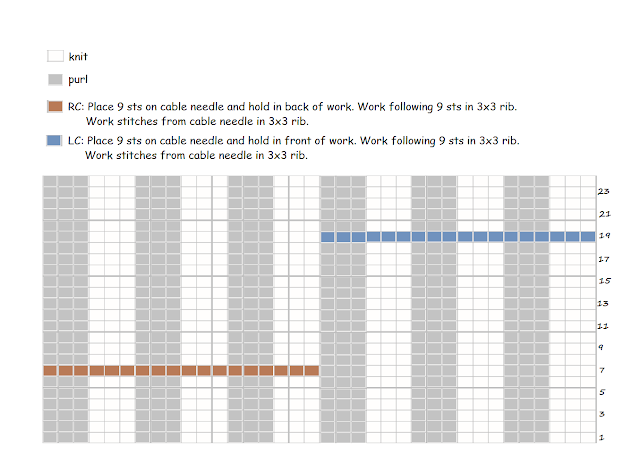 - US 6 (4mm) needles for the body. I used 32” circulars to work magic loop, 16” circulars or DPNs will of course do just as well. You will also need a cable needle. Sl1, k2tog, psso : slip 1 stitch knit-wise, knit 2 together, pass slipped stitch over the k2tog. sl1, p2tog, psso : slip 1 stitch purl-wise, purl 2 together, pass slipped stitch over the p2tog. Cast on 120 stitches with US 3 needles, place marker and join to work in the round. Work in 2x2 rib for 1.5 inches. Switch to US 6 needles and continue in 2x2 rib for 1 more round. Next round : *(k1, k1fb, p1, p1fb), repeat from * to end end of round. 180 sts. Next round : Work in 3x3 rib for 4 rounds. Next round : knit 6 more rounds keeping in 3x3 rib (k3, p3). Next round (decrease round). *(k1, k2tog, p1, p2tog). Repeat from * to end of round. Next rounds : Knit 2 rounds in 2x2 rib (k2, p2). Next round (decrease round) : *(k2tog, p2tog). Repeat from * to end of round. Next rounds : work in 1x1 rib (k1,p1) for 2 rounds. Next round (decrease round) : *(Sl1, k2tog, psso) (sl1, p2tog, psso). Repeat from * to end of round. Break yarn, draw through remaining stitches and pull closed. Weave in ends. 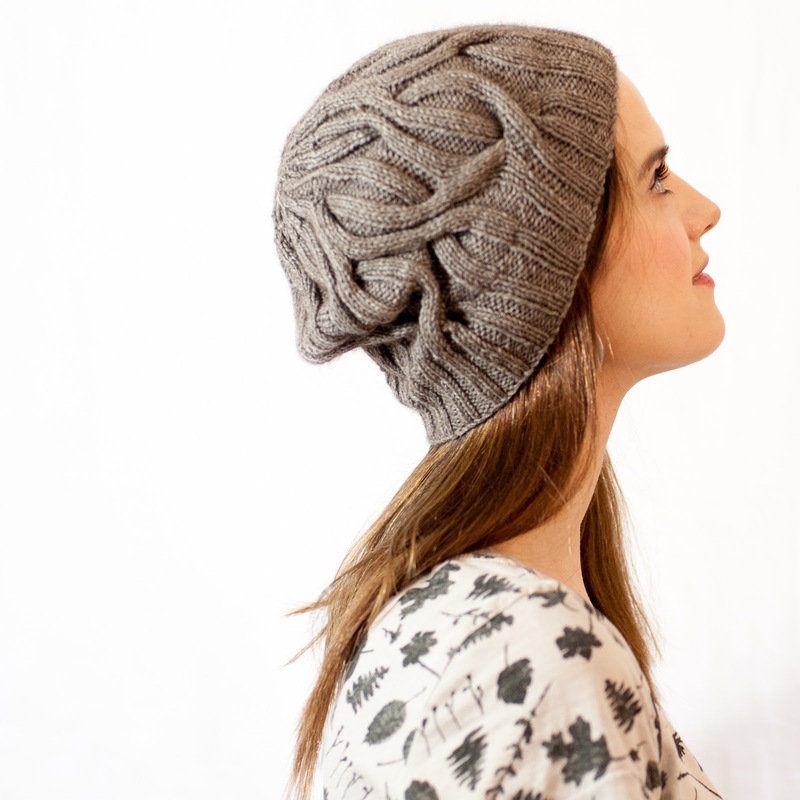 Block the body of hat to bring out the cables, but be very careful not to stretch the brim. 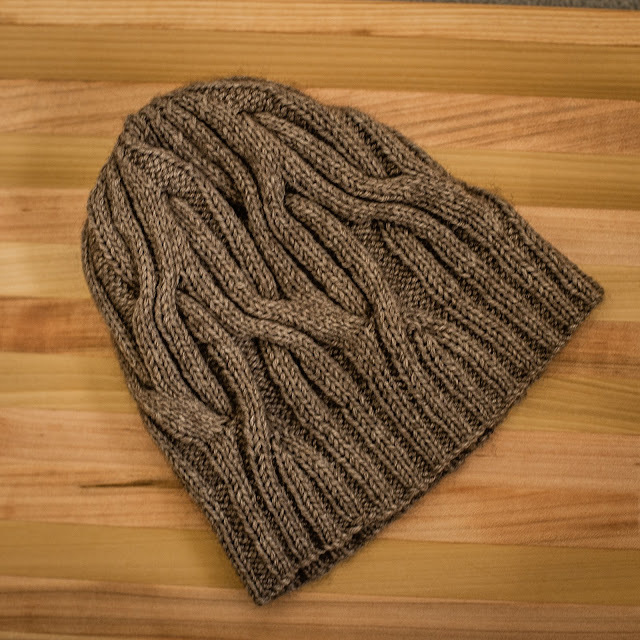 As for my other free patterns, if you enjoyed knitting this hat and it keeps you warm, please consider helping the less fortunate to be a bit more comfortable as well by donating funds, time, clothing, or non-perishable items to your local homeless shelter or food bank. Thank you!